A year in review: this post continues with the series of the most cited articles in every month of 2017. Here we feature the most cited articles of September and October 2017. The most cited articles is published in Advanced Matrials, and with authors from Dresden Integrated Center for Applied Physics and Photonic Materials (IAPP) and Institute for Applied PhysicsTechnische Universität Dresden in Germany, ICMAB, and Beijing National Laboratory for Molecular Sciences in China. 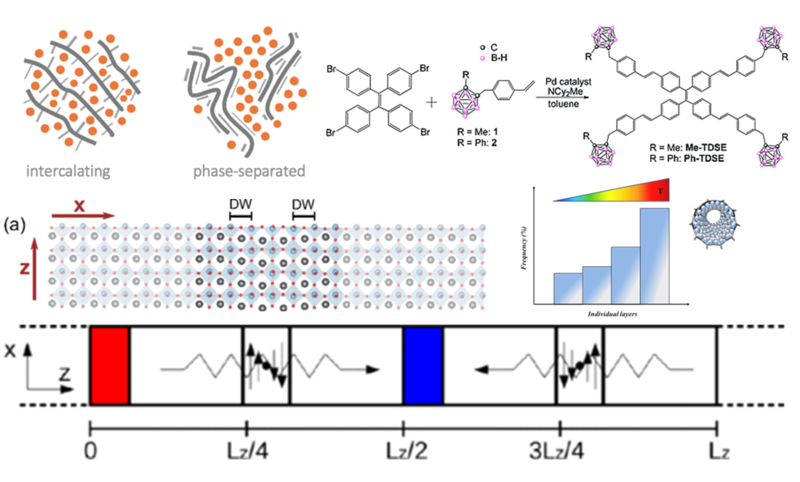 Polymer: Fullerene Bimolecular Crystals for Near-Infrared Spectroscopic Photodetectors. Tang, Zheng; Ma, Zaifei; Sanchez-Diaz, Antonio; Ullbrich, Sascha; Liu, Yuan; Siegmund, Bernhard; Mischok, Andreas; Leo, Karl; Campoy-Quiles, Mariano; Li, Weiwei; Vandewal, Koen. ADVANCED MATERIALS. SEP 6 2017. 29, 33, 1702184. DOI: 10.1002/adma.201702184. Spectrophotometric methodologies are widely employed for resolving chemical compositions in medical diagnosis, envi-ronmental monitoring, agricultural production, astrono-mical investigation, imaging, and surveillance. The study develops organic fotodetectors that detect light with energies below their band of absorbion, with high efficiency and approaching commercial Si photodetectors. The first one is published in the journal Carbon, from researchers of ICMAB and ICN2. Encapsulation of two-dimensional materials inside carbon nanotubes: Towards an enhanced synthesis of single-layered metal halides. Sandoval, Stefania; Pach, Elzbieta; Ballesteros, Belen; Tobias, Gerard. CARBON. OCT 2017, 123, 129, 134. DOI: 10.1016/j.carbon.2017.07.031. The unique properties of two-dimensional (2D) nanomaterials make them highly attractive for a wide range of applications. As a consequence, several top-down and bottom up approaches are being explored to isolate or synthesize single-layers of 2D materials in a reliable manner. Here we report on the synthesis of individual layers of several 2D van der Waals solids using carbon nanotubes as directing agents, thus proving the versatility of this approach. This opens up a new strategy for the isolation of individual layers of a wide variety of metal halides, a family of 2D materials that has been barely explored. The second one in the list, an article from European Journal of Inorganic Chemistry and includes authors from ICMAB, Madrid Institute for Advanced Studies – IMDEA Nanoscience, University of Valencia and UniversidadNacional Autónoma de México in México. The third one, published in Physical Review Materials from the Theory and Simulation group at ICMAB, and the Luxembourg Institute of Science and Technology in Luxembourg. Modulating the polarization of a beam of quantum particles is a powerful method to tailor the macroscopic properties of the ensuing energy flux as it directly influences the way in which its quantum constituents interact with other particles, waves, or continuum media. Here, we report on atomistic phonon transport calculations demonstrating that ferroelectric domain walls can operate as phonon polarizers when a heat flux pierces them. And the last one mostly cited, published in Physical Review B, and as the previous one, it is from the Theory and Simulation group at ICMAB, the Luxembourg Institute of Science and Technology in Luxembourg, and we add here the Donostia International Physics Center in Donostia-San Sebastián. The ease with which domain walls (DWs) in ferroelectric materials can be written and erased provides a versatile way to dynamically modulate heat fluxes. The thermal resistance of the ferroelectric material is shown to increase up to around 20%, in the system sizes considered here, due to the presence of a single DW, and larger resistances can be attained by the incorporation of more DWs along the path of thermal flux. These results, obtained at device operation temperatures, prove the viability of an electrically actuated phononic switch based on ferroelectric DWs.